November 19, 1994. No dash to represent the life lived. No poem to explain the pain of this deep loss. No viewing to say a final good-bye. No funeral to receive love and prayers from family and friends. No closure for this broken momma heart. On that day, November 19, 1994, a part of me died too. 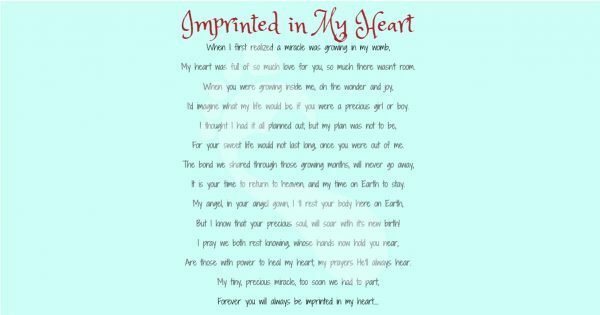 I tried everything to properly grieve, to numb my pain, to forget that we lost our baby, and to love the body that I felt failed me. Nothing worked until I read about the Angel Gowns Project. As soon as I read the stories about loving and giving individuals sharing their wedding gowns with experienced and labor of love seamstresses, I knew that this was the closure I have been seeking for 21 years. My husband and I have been married 25 years this year. We have two grown young men, ages 23 & 19, and one Angel baby that would have been 21. 21 years ago we planted a tree as a living memorial for our Angel baby that passed away 22 years ago. I have loved this tree and it has been a comfort and a labor of love to get it planted, established, and keep it growing. It is a majestic and beautiful representation of our little one that was gone too soon. I think about the time spent caring for this tree and how others may not understand or appreciate the work that has gone into it…..and then I think of how the Angel Gowns Project parallels my endeavor. 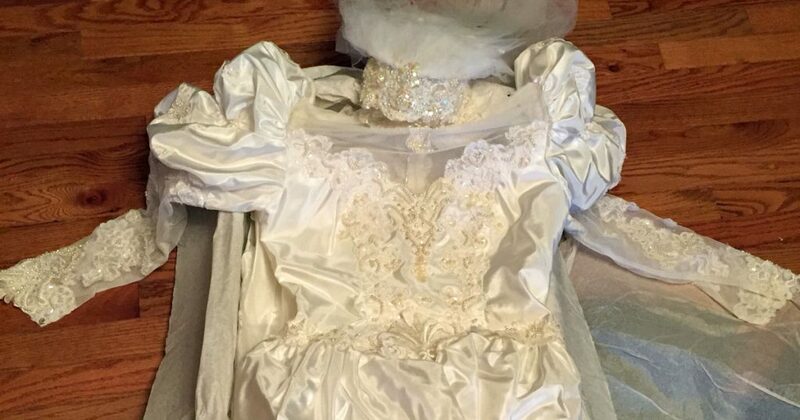 My heart leapt when I read about the love, care, and thought that goes into cutting up a treasured wedding gown to make precious Angel Baby Gowns. I knew that this has been what I’ve been searching for these past two decades. Closure. Closure in the form that simulated my experience. A whole person, then loss, and a life transformed into something more loving, caring, and thoughtful. Me. And each wedding gown goes through the same process. How amazing is that? How perfect for me. My gown has been sitting in our basement, boxed up since our wedding, and no daughter to hand it down to someday. 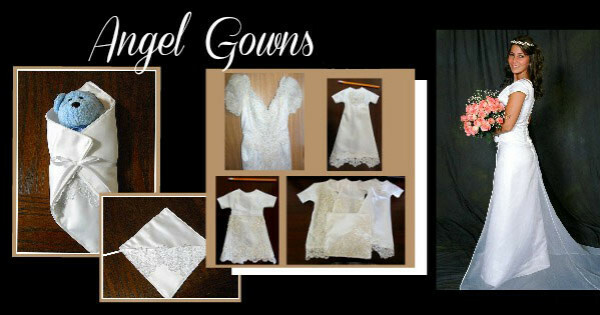 After I read the article I raced downstairs, grabbed the box with my gown inside, brought it upstairs, opened it up, told my husband and son my intentions, took pictures of it and sent in my money and request to the Angel Gowns Project. 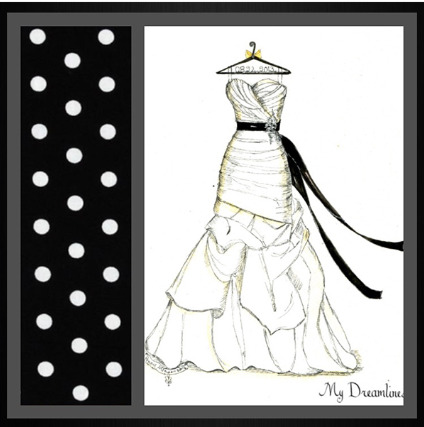 A few weeks later I received my email to say the seamstresses were ready for my wedding gown. I hesitated. I paused for two days. Wondering if I was making the right decision. Finally, the third day I loaded my gown up, took it to the UPS drop-off and mailed it to them. My heart felt the same deep ache it had 22 years ago. Then later after I grieved for awhile, I felt peace. I began to feel closure. There was a difference with this that I didn’t have 22 years ago. 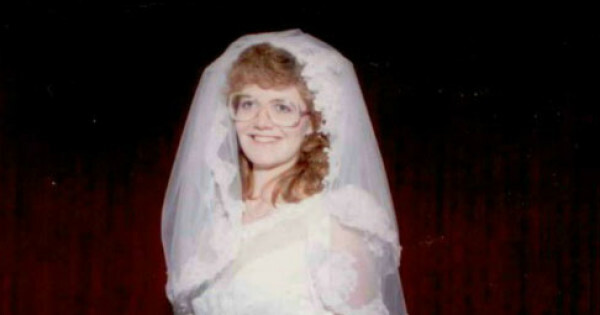 I would see the wedding gown when it was returned to me. 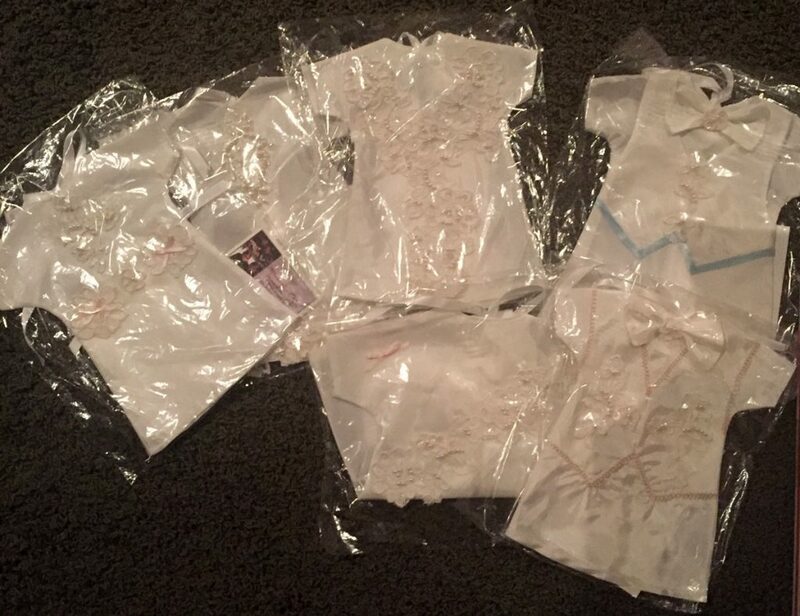 I would have closure as I determined how to give out the gowns to be used for other grieving parents. I had peace. I wasn’t expecting a package when I came home from work almost two weeks ago. I hadn’t ordered anything. What could it be? I read the return label: Angel Gown Project. My heart leapt again! I stared at the box. I wasn’t ready to open it. I couldn’t make myself open it by myself. I waited. I waited until my son and husband returned home and we opened it together. My husband and I grieved together, something we couldn’t do 22 years ago. I had in front of me all of the pieces needed for closure. There may still not be a dash in the sense that we all think but there is now to me. There may not have been a poem years ago but now there is this story to tell that is giving a voice to a seldom talked about loss. There may not have been a viewing back then but there is today with the beautiful Angel Baby Gowns. There may not have been a funeral for my Angel Baby but now there would be gowns for other Angel Babies and grieving parents will receive the necessary comfort during a time of loss. There may not have been closure 22 years ago but there is more closure today and that is because of each one of you. Thank you. God Bless each of you and the lives you touch.